The goalkeeper made three fine saves in the second half after a quiet opening 45 minutes. 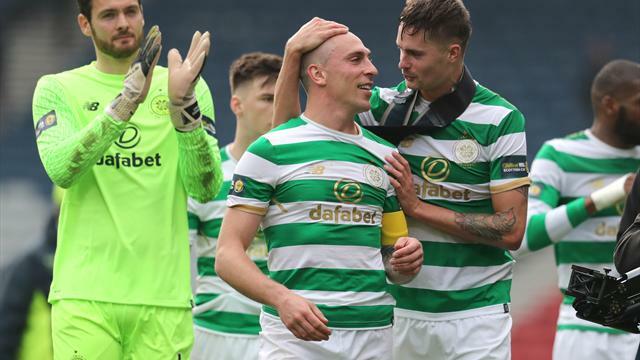 Celtic goalkeeper Craig Gordon admitted he was glad to get something to do in the second half of his side’s 4-0 William Hill Scottish Cup semi-final victory after his quietest 45 minutes of action against Rangers. Gordon did not have a save to make until Rangers were three goals and a man down after Ross McCrorie was sent off for pulling Moussa Dembele down in the box. Rangers seemed to be stung into action and Gordon pulled off three excellent stops in quick succession, two from Alfredo Morelos and one from a Bruno Alves header. But Celtic soon regained complete control before Olivier Ntcham followed Dembele in netting a penalty. Gordon spent several minutes of the first half bursting balloons which had drifted on to the Hampden pitch as goals from Tom Rogic and Callum McGregor put Celtic in command. After setting up a final against Motherwell, Gordon said: “The first half was really quiet. Unusually so. I didn’t even have many touches with my feet, there wasn’t many pass-backs. “We really had a grip on the game. Normally we circulate the ball and pass it around at the back, but it was a lot further up the park, which was good from our point of view. “The guys in front of me were playing really well. It was just nice to sit back and watch that performance unfold. “It was always going to be the case that I would have to keep my concentration and, if something did arise, to try and match it. After Dembele dinked home a 52nd-minute penalty, Rangers’ fans might have feared an even bigger humiliation following two 5-1 defeats to their Glasgow rivals last season. But their team should have hit back with Morelos missing another sitter against Celtic, although Gordon takes huge credit for getting down to prevent what seemed a certain goal. “Naturally they gave it a good go until we managed to get used to playing the 10 men and got our ball and started passing it again,” the 35-year-old said. “We did go through 10 minutes where we did struggle to get our foot on the ball and during that time I had to make a few saves. It’s always nice to contribute to a win by making saves like that.